My book beginning is from Starhawk, A Priscilla Hutchins Novel, by Jack McDevitt. This is a Science Fiction novel I checked out from my local library. Priscilla was sitting in the Skyview, enjoying a grilled cheese, her notebook propped up on the table. But she wasn't reading. The room-length portal had as usual, stolen her attention She was looking down at the Asian coast." When Elena is taken captive, fearless Ragnar risks everything to save her. Now they are stranded with only each other for company. Suddenly every longing, every look, every touch is forbidden. Elena could tempt a saint—and sinner Ragnar knows he won’t be able to hold out for long. I loved To Sin With a Viking, the first book in the Forbidden Vikings series and was looking forward to Ragnar and Elena’s story. I was a little disappointed. This is a story of unrequited love by Ragnar’s and on Elena’s side unrecognized love. It just took to long for the two to realize that they belonged together. With that as a premise there should have been a lot of tension. There was some but not enough for me. I did like the view into a period that I knew little about. It was interesting to see how the Vikings settled in Ireland and to learn a little more about that time period. I will try the next book in the series. This is a time ripe with possibilities. Harlequin published To Tempt a Viking by Michelle Willingham in 2014. I received an ARC of To Tempt a Viking from Netgalley. 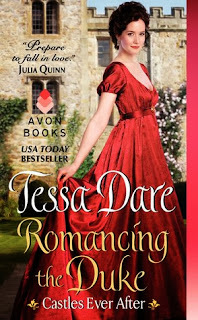 "In the first in Tessa Dare's captivating Castles Ever After series, a mysterious fortress is the setting for an unlikely love . . . I don’t know how Tessa Dare comes up with these ideas for book series but I am so glad that she does. I really did not think she could match the Spindle Cove series but with Castles Ever After she has come up with at the very least a match. What happens when you mix an old run down castle, a woman out of resources and a man hiding from the world. What happens in Romancing the Duke is a fun read full of romance, drama, secrets, and most of all fun. That is what Tessa Dare does best; she gives her readers a great story filled with scenes full of laughter. Izzie finds that her fairy tale does come true when she inherits an old castle complete with the man to make her dream come true. Romancing the Duke is a great start to the Castles Ever After. I can’t wait for the next woman to find herself with a castle and of course a man to make the fairy tale come true. Avon published Romancing the Duke by Tessa Dare in 2014. I received an ARC of Romancing the Duke from Edelweiss. My Teaser this week is from Atonement by B. J. Daniels. I read one of her books over a year ago and immediately became a fan. Atonement will be released on Feb. 25th. I receivd an ARC from Netgalley. This is part of an ongoing series set in Beartooth, Montana. "Do you like what I've done with the house? Charlotte asked, and for a moment looked her age." 50% on my Kindle. •I decided to write on the last question: maybe you just want to ramble on about something else pertaining to books — let’s hear it, then! Participating in the January Author & Blogger Fan Appreciation Giveaway, got me thinking about how much book bloggers do to help spread the word about authors’ books. (Lots!) It seems only fair to reciprocate and send a little love and, hopefully a few new readers, their way. So I’m starting a new blog feature, Book Blogger Love*. 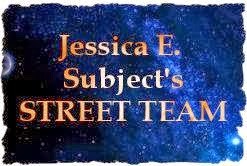 Some of the bloggers will cover the genres I write, some won’t. The only requirement is that they have an active book blog. 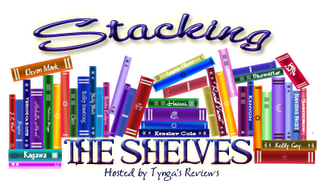 Today I’m starting with the January Author & Blogger Fan Appreciation Giveaway organizer, Jenn of Back Off My Books. There is a giveaway on the post and if you leave a comment you could be a featured blogger sometime in the feature. You can also vote on your favorite blog and help them win a prize. Fire with Fire is the first book in the Tales of the Terra Republic future history. It does not say that on the book, I had to go to Charles Gannon’s web site to fine that important information. I did know as I got near the end of Fire with Fire that it could not be a stand-alone. It just ended with too many things up in the air. I recommend reading Fire with Fire but you need to know that this is the first book and there is no mention of when book two will come out. However there is much more information about the world Gannon has created at www.charlesegannon.com. The site is worth a visit. World Building: The world building in Fire with Fire is massive. It starts with the first page and continues through out the book. You start with Earth politics and continue to interstellar politics and the possibility of war. Plot: Each section of the book features a different plot point. One of the interesting sections of Fire with Fire is where Caine finds evidence that humans were on Delta Pavonis around 20,000 years ago. They have disappeared and no one knows what happened to them. That is one of the threads that is not pursued. I think it is a very important element in the plot and will be important in the next book. Most of the sections come together as part of the overall picture but some are developed but not pursued in Fire with Fire. Look for a surprise at the end. Part of the plot is Caine trying to remember the 100 hours he lost when cryocelled. That is answered near the end of the book. Characters: Caine is the main character and everything and everyone that appears does so in conjunction with him. He is very smart and sees thing that the others do not. That makes him very valuable but because of the cryocelled incident and the missing hours he does not trust the people he has to work with. I found that I somewhat liked and very much disliked the same people. Writing: Fire with Fire is a well-constructed story. The writing is on point and keeps everything moving often in an unexpected direction. I do hope Baen has contracted for book two and it will be out sometime soon. I really want to know if my take on the title is correct. Fire with Fire? If Earth humans are fighting with fire who are they fighting? 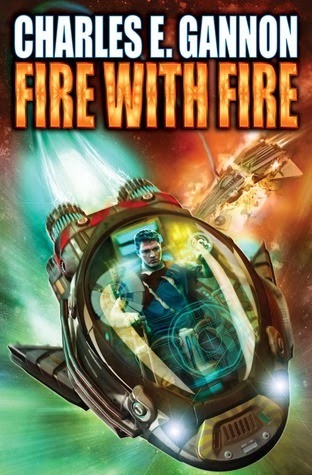 Baen published Fire with Fire by Charles E. Gannon in 2013. I am leaving in a long trip Wednesday so I'm writing this post on Tuesday. I am driving and I hit the library for books on CD. I always check out more than I can listen too just in case one does not work or I don't like one I choose. This time I got 6 and will probably listen to 3. I was not going to get a book but then one that I have been wanting to read was on the new book shelf so I have one book. My book beginning this week is from Alien Research by Gini Koch. This is book 9 in the Alien novels. "In all the time man has been on our good planet Earth, we've stared at and striven for the stars, at least in some way. Frankly, my experience has been that what a goodly number are doing is staring at and striving for more wealth and power. And since alines joined us on Earth, those same people have been striving even harder to control said aliens, presumably to use them to get even more wealth and power." From Jodi Thomas...Callie has done a lot of crazy things, but it’ll take one more to prove she isn’t nuts: find a husband, fast! Her only requirement: he has to be taller than she is and swear not to have her committed during their ruse of a marriage. From Jo Goodman...Felicity Ravenwood was raised to be independent-minded, but when this runaway bride opposes her father’s choices, it is up to Nat Church to bring her around. But he doesn’t count on springing her from jail, holding her hostage, or falling head over boot-heels in love. From Kaki Warner...Two strangers on a train have more in common than they know—both have hidden purposes and ties to a Nebraska bank robbery. But when their schemes unravel, they find a bigger surprise awaiting them than either could have imagined. From Alison Kent...When runaway New York socialite Maeve Daugherty joins her father’s bodyguard Zeb Crow on his personal mission of revenge, what was a slightly scandalous new life as a bookkeeper for an infamous San Antonio brothel becomes downright dangerous. But that’s not stopping Maeve from having the time of her life." I am a big fan of Jodi Thomas and Jo Goodman so when I saw they both had a novella in Boots Under Her Bed I immediately purchased the book. I was not disappointed. Usually in a book like this there is one novella that is my hands down favorite and the others are just OK. Not the case here. I loved all four. Each author produced a very strong and well written story. Jodi Thomas wrote a story about a marriage of convience that turned into a love match. Jo Goodman used Nat Church as her hero. He is the hero of dime novels in some of her books. The story was really cute. This is the first time I had read anything by Kaki Warner and Alison Kent. Both featured unusual scenes and characters in their novellas. 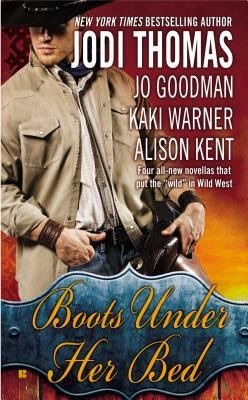 If you are a fan of Western Romances this is a very good choice. Pick it up for four fun stories filled with romance and set in the old west. Berkley published Boots Under HerBed by Jodi Thomas, Jo Goodman, Kaki Warner, and Allison Kent in 2014. 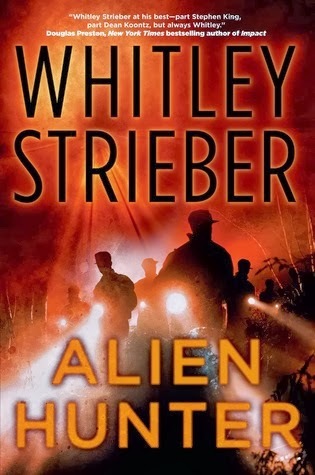 "Alien Hunter is a searing new novel from New York Times bestselling author Whitley Strieber. Without fully understanding what Glass and her team are doing, Flynn steps into a hidden world of extraordinary challenge and lethal danger. The job is the most difficult police assignment ever known to man, but the idea is the same—find the bad guys. Stop them." Alien Hunter is the first in a new series and a very intense book. Look for non-stop action, a lot of violence and some very interesting bad guys. The book starts with Flynn Carroll waking up and finding his wife missing. It turns out that there are many missing persons who fit the same profile. They are not unhappy, they pack the same thing, they disappear almost in plain site and they are never seen again. Flynn is policeman who had looked for clues for years when he is approached to join a unit is trying to catch the people who are doing the kidnapping. Flynn is the main character and he is very obsessive. Diana is the head of the unit Flynn joins and she is really over her head. In addition she is keeping secrets. When everything starts to go bad Flynn must use all his skills and some people who own him favors to stop the kidnapping. Look of non-stop action, a lot of violence and the set up for a new series. Action is at the heart of this book and while there is some character development it is just enough to keep the story going. The plot is laid out at the beginning and does not deviate even though there are a few surprises. I don’t think it is a spoiler to say there are aliens here and some of them are very, very bad people. The aliens should be a surprise but because of the title they are not. 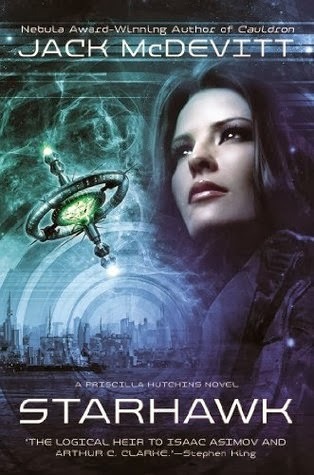 Tor published Alien Hunter by Whitley Striever in 2013. I checked Alien Hunter out from the library. 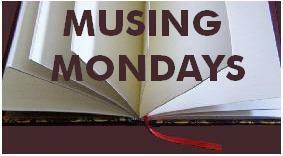 My teaser is from a book that has been on my TBR pile for a few weeks. It is Hell Bent: A Broken Magic Novel by Devon Monk. It is the first in a new series by Monk. "She laughed, truly laughed. It was a musical sort of thing that filled the silent places in me." "Instead of the deadly force it once was, magic is now a useless novelty. But not for Shame Flynn and Terric Conley, “breakers” who have the gift for reverting magic back to its full-throttle power. In the magic-dense city of Portland, Oregon, keeping a low profile means keeping their gifts quiet. After three years of dealing with disgruntled magic users, Shame and Terric have had enough of politics, petty magic, and, frankly, each other. It’s time to call it quits. When the government discovers the breakers’ secret—and its potential as a weapon—Shame and Terric suddenly become wanted men, the only ones who can stop the deadly gift from landing in the wrong hands. If only a pair of those wrong hands didn’t belong to a drop-dead-gorgeous assassin Shame is falling for as if it were the end of the world. And if he gets too close to her, it very well could be." I am getting ready to go on a one week trip and am trying to finish a book I got from the library. That should not be a big thing but it did get me thinking. The book, Fire with Fire by Charles E. Gannon, is one I have on my iPad but when I saw it in hard copy I checked it out. I wonder how many of us do the same thing? Buy an ebook but find a hard copy in the library, check it out and read that instead of the ebook. I know this is not the first time I have done this. Let me know if you do the same. 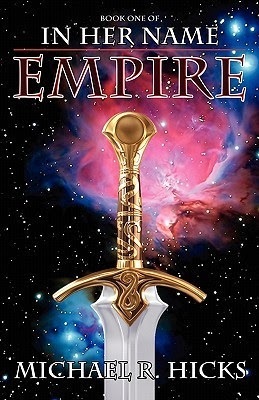 "Shielded from Imperial attack by the powerful espers who have sought refuge there, Mistworld--the haven for outlaws, rebels, and misfits--faces a new threat from a shadowy figure intent on stalking its streets." Goodreads didn’t say much. 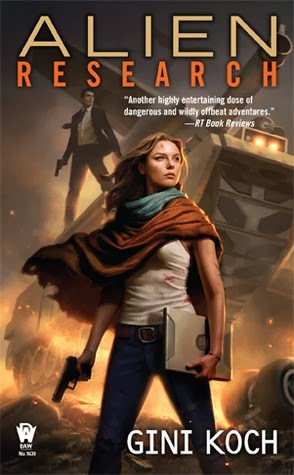 Mistworld is the first in the Twilight of the Empire series. Ghostworld book #2 and Hellworld book #3 are also available. I’m not sure this is a new series but when I went to Simon R Green’s web site these books were not even mentioned. . It is placed in the Empire, the same universe as Green's Deathstalker books. However this series is unique in its setting. Mistworld is the only outlaw planet left in The Empire universe. Mistworld begins with a series of chapters that feature different characters. 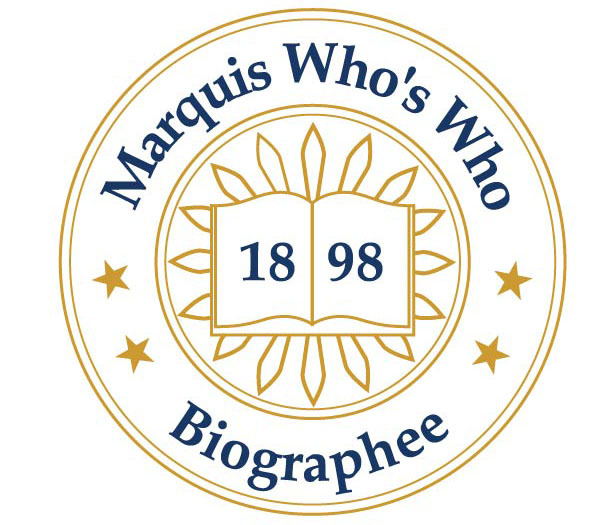 Each chapter combines back-story, world building and character development. It was a little slow going at first as there was a lot that had to be introduced and the plot seemed to be the part that was left out. It did take awhile for all the threads to come together but once that happened it was hard to put the book down. The setting on Mistworld sounded familiar to me. It is a world cut off from trade with a very cold climate. I didn't find the setting unique but it did fit the story. There were some very strong characters in Mistworld. There were also some characters that were very developed who were killed off early in the book. There was a satisfying conclusion to Mistworld. The main characters who saved the day were neither all good or all bad. That made for some interesting interaction. Mistworld is an interesting book and I am planning to read the rest of the series. The book fits the way Simon R. Green writes. There is a lot of violence but it fits the setting. His writing style carefully sets the scene and lets the story develop in a careful and controlled manner. 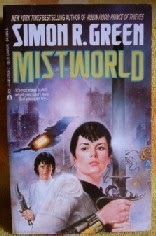 Open Road Media Sci-Fi & Fantasy published Mistworld by Simon R. Green in 2013. I received an ARC of Mistworld from Netgalley. Not many books this week and all are books I purchased from Amazon. "Some people would say it's a bad idea to bring a fire-spider into a public library. Those people would probably be right, but it was better than leaving him alone in the house for nine hours straight. The one time I tried, Smudge had expressed his displeasure by burring through the screen that covered his tank, burrowing into my laundry basket, and setting two week's worth of clothes ablaze." "Isaac Vainio is a Libriomancer, a member of the secret organization founded five centuries ago by Johannes Gutenberg. 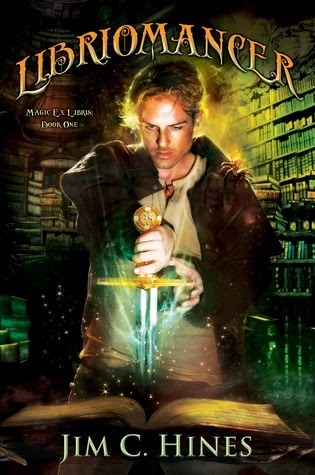 Libriomancers are gifted with the ability to magically reach into books and draw forth objects. When Isaac is attacked by vampires that leaked from the pages of books into our world, he barely manages to escape. To his horror he discovers that vampires have been attacking other magic-users as well, and Gutenberg has been kidnapped. With the help of a motorcycle-riding dryad who packs a pair of oak cudgels, Isaac finds himself hunting the unknown dark power that has been manipulating humans and vampires alike. And his search will uncover dangerous secrets about Libriomancy, Gutenberg, and the history of magic." "A decade in the future, humanity thrives in the absence of sickness and disease. But these parasites are getting restless. They want their own lives...and will do anything to get them." Here is the basis of the Parasite story. The more we protect ourselves from the environment the more we lose our immunity. Symbogen is a large corporation that has developed an offspring of the tape worm that will keep people healthy. Parasite starts with one person, supposedly brain dead who suddenly is not. Sally Michell was in a car crash. She was brain dead and the doctor was trying to get the family to turn off the machines when she suddenly woke up. Sally Mitchell had one of their tapeworms. 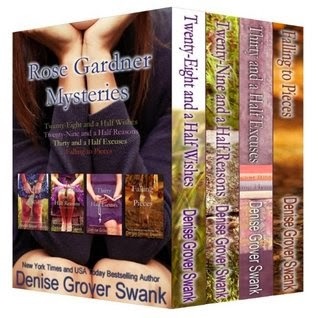 Look for a diverse cast of characters, tension on top of tension and secrets after secret. All of that makes up Parasite. Parasite is divided into very well though out and well-written sections. Each section reveals a little more about the puzzle that is Sally Mitchell. Part of Sally’s secret is revealed at the very end of the book although I don’t think it is a secret from the reader, only from Sally. This is Book One. 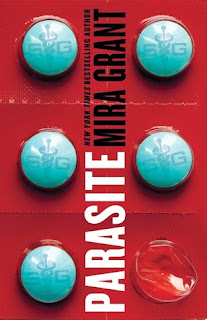 Orbit published Parasite by Mira Grant in 2013. I received an ARC of Parasite from Netgalley.